Wilson is an emotional wreck following his wife’s suicide and he turns to sniffing petrol fumes in attempt to deal with his grief. His wife’s suicide note remains sealed and Wilson cannot bring himself to open it. 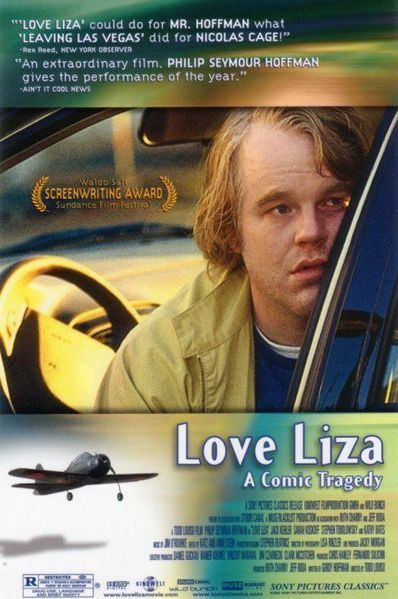 Philip Seymour Hoffman stars in the little known and largely forgotten Love Liza (2002). Hoffman plays the tragic Wilson who has many psychological, physical, and emotional issues to deal with. The recent death of his wife has left Wilson with a pretty severe addiction to petrol fumes. This addiction is both humorous and sad and it manifests throughout the film with increasingly painful consequences. Love Liza is a film full of silence and sombre touches and there are some lovely scenes that really stand out. Wilson’s love of remote control aeroplanes is a particularly bittersweet trope. At its heart this is a film about loneliness, grief, and losing everything that matters. Wilson is a man at rock bottom and there is sadness infused in every intoxicated moment. Love Liza is a meditation on the human condition and throughout the film, penned by Hoffman’s brother Gordy, Wilson is tested considerably. Often filmic characters bear little relation to real people and instead conform to stereotypes. Wilson is no stock character however and his multi-layered personality is unravelled down to its bare bones. This is not an inspirational film and there is something unbearable about seeing a man at his lowest point, but Hoffman treats Wilson with consideration. His mood swings and his tantrums are somehow relatable and Hoffman reveals a character that is incredibly detailed and real. This is a film for Hoffman fans and perhaps a good role to define his diverse career by. Love Liza provides Hoffman with the chance to express nearly every conceivable emotion and he does so with considerable skill.The film could be considered flimsy, or perhaps even insubstantial, but Hoffman is hypnotic in this role. The scenes bleed satisfyingly into one another and the soundscape is both bleak and trippy. Wilson is a man adrift, disconnected and the editing reflects this. Without Hoffman, Love Liza would be problematic and perhaps unworkable. But Hoffman ties each disparate, emotional scene together with his on screen talents. Every part of this film is about movement, about running away, and the heartbreaking truth for Wilson is that he has nowhere to go. Love Liza isn’t a plot driven film; it’s a touching and bittersweet character piece. Be patient and you’ll find Hoffman at the top of his game.